Hello my gorgeous readers !! Often I have seen women talking about their makeup queries, skin problems, hair problems and health issues like obesity etc. quite openly. However, there is still something which should be given the utmost importance but instead, is ignored. You might have already guessed by now but incase you haven't then I am talking about personal hygiene. A lot of women suffer from infection, irritation, itching and burning sensation down there yet feel reluctant to talk about these things. They visit a gynaecologist only when things seem to slip out of hands. Regular hygiene needs to be maintained along with occasional visits to gynaecologists for overall feminine health. "Summer's Eve Feminine Wash For Sensitive Skin"
Product description: Summer's Eve Intimate wash is a soap free cleaning product which is meant to be used on the outer genitalia in women to maintain hygiene and keep infection and odour at away. Availability: Priceline, Chem-mart and other pharmacies. 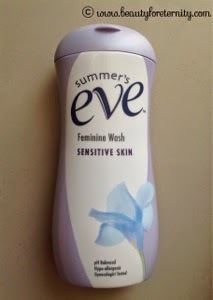 Packaging: Summer's Eve Feminine Wash for sensitive skin comes in a pastel lilac coloured sturdy and opaque plastic bottle which has a flip open cap. 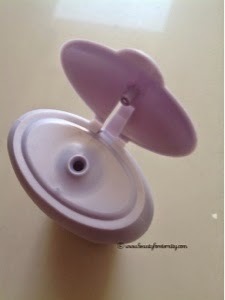 The cap opens easily and closes securely and there is no chance of any leakage of the product so it's travel-friendly. The curvy shape of the bottle allows a good grip so it does not tend to slip when your hands are wet and soapy during shower. This intimate wash from 'Summer's Eve' is a fragrance free, soap free,clear and transparent intimate wash which has a thick gel like consistency. It lathers really well and you need only a small amount for thorough cleaning in your intimate area. It does not burn or irritate the 'V' area and leaves it super clean. It does not dry out and cause any discomfort and is very gentle. It rinses off very well and leaves you feeling super clean and comfortable. 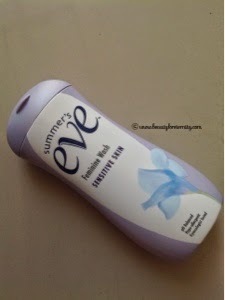 It is actually quite moisturising and you don't need to use anything else post washing your genital area with this intimate wash from Summer's Eve. I have been using it for more than a year now and I have had no issues with this product. 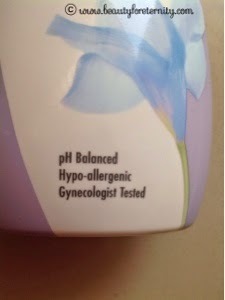 It is very mild and does not interfere with the natural pH level of the vaginal fluids and thus keeps that fishy smell at a bay which actually arises due to infections and pH disturbance in that area. It is absolutely safe to be used during menstruation also along with regular days of the month. Yes, go for it. I highly recommend this product. It is safe for hyper sensitive people too.